LULAC GLANCES Other Scholarships for LATIN AMERICANS will be announced in the LULAC GLANCES AS SOON AS WE GET THE INFORMATION ON THEM. If you are a graduating high school senior of Mexican descent or LATIN AMERICAN descent, or know someone who is and wants to go to college, but does not have the means, then please have hi or her contact LULAC in Davenport, in Des Moines, or in Fort Madison. We in LULAC have a firm belief that in order to improve the social and economic lot of the Latin American we must stress that our young people, who are the leaders of tomorrow, get a College education. NOT just a high school education or a trade school education, but a college education which will adequately prepare them for their rightful place in today's society. GRAPE BOYCOTT IN IOWA GAINING MOMENTUM............. 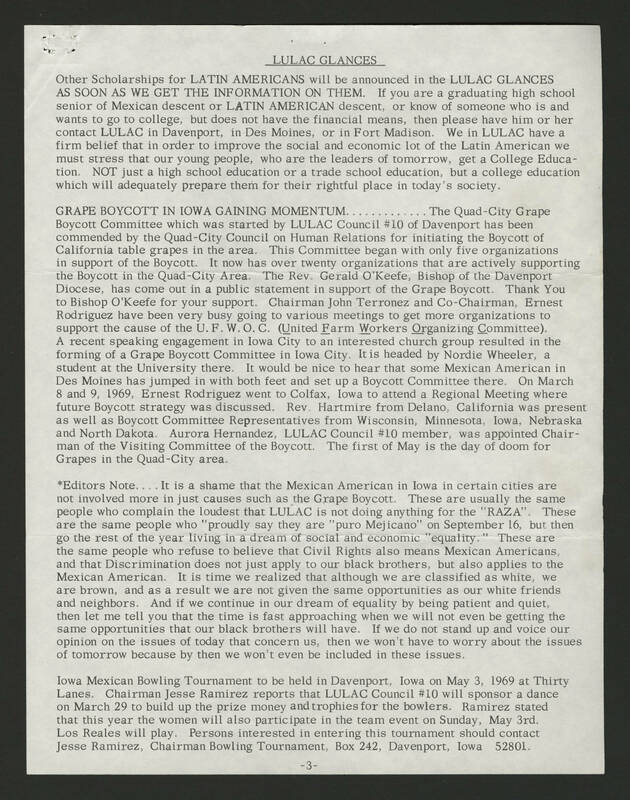 The Quad-City Grape Boycott Committee which was started by LULAC Council #10 of Davenport has been commended by the Quad-City Council on Human Relations for initiating the Boycott of California table grapes in the area. This Committee began with only five organizations in support of the Boycott. It now has over twenty organizations that are actively supporting the Boycott in the Quad-City Area.